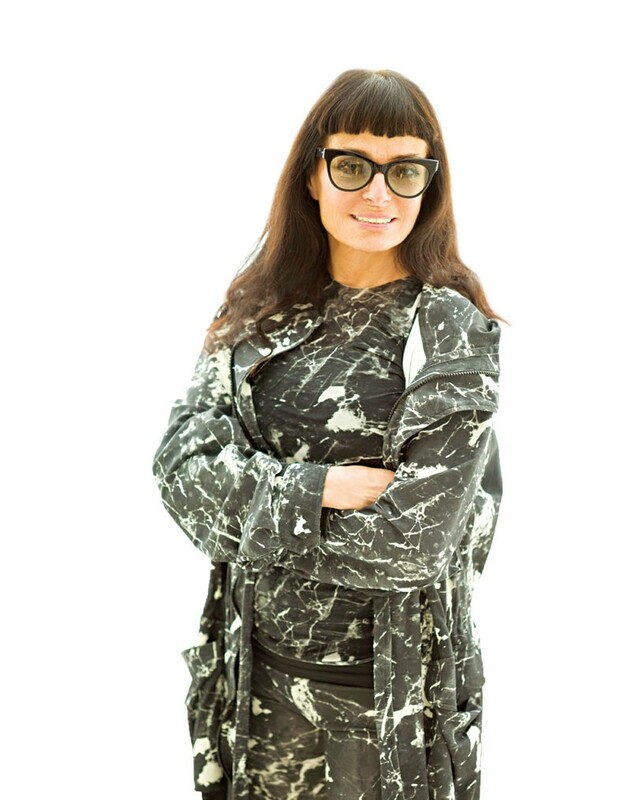 What’s New with Norma Kamali? An iconic fashion designer for decades, Norma Kamali is taking her experiences, shedding her skin, and exploring new territories. We visited her New York showroom to discuss what’s next. What’s new with the label? The big picture is to expand the concept of fitness, health, beauty, and style, and less fashion. It’s a very disruptive time, so the word “fashion” almost seems old-fashioned to me. My goal is to make women feel good about themselves either through what they’re using for fitness and health or what they’re wearing. When you’ve been doing this since 1967, there’s always an evolution and reinvention. I never consciously think strategically—it’s more emotionally and intuitively. I’m never planning to get a new kind of customer. I see people wearing my clothes that are representative of today but I don’t think, “Oh, I want Selena Gomez [wearing my clothes].” But it happens. In this business, it has to do with having a sense of what has been done already and what hasn’t been done. I have the good fortune of being around for as long as I have. I’m one of the best barometers around because I’ve lived through the ’60s to today. The most important thing is to look at clothes in a practical but fun way, not so much in a fashion-y way. In this disruptive time, it’s almost anti-fashion. For 2016 our message will be strong on fitness, health, and beauty. If you’re feeling good about yourself and you’re healthy, then even a T-shirt is going to look good on you. Not only will our website be putting forward a lot of great information and products that I’ve been putting together, but the way the clothes are presented will be efficient, smart, and imaginative. Tell us about your wellness center. Growing up, my mother was juicing, using olive oil for everything, and doing exercises to Jack LaLanne. He also juiced—and this is the ’60s and ’70s. My mother was a little eccentric. I would fight her, and then I realized, like we all do, everything we fight we become. With 9/11, the thought that something could happen any minute added to the stress that we all have. That breaks down your immune system, so I thought I would do a wellness café. That was the initial concept, but it was done from the point of view of vanity, because after all, I am a designer. I built the café with products we made or ones that I liked. Will we find olive oil in those? Yes, there are so many great uses for olive oil. We have everything from tooth soap to exfoliants. A couple of years ago I was at a Yankees game and I sat next to this guy from Barcelona, and he said that he was going to bring the best olive oils to the States. I told him I have so many ideas. He invited me to search for the best olive orchards in the world. We started with food shows, then regional shows, then specific orchards, to finally find some of the best orchards worldwide. They make special blends for our café and I package them as if it were a wine or a fragrance. In addition to wellness, you’re into working out. What do you do? I work out every day. I go to Physique 57. Nine years ago, on New Year’s, I decided I wanted to change my workout and I’d choose whatever’s closest to the store. Physique 57 is four doors away. I had no idea what it was but I signed up. I went to the class and I was like, “What is this?” It was so hard. But I signed up, so I was like, I’m coming back tomorrow! It’s the best workout I’ve ever done. Tell us about your active line. In the late ’70s I started to do sweats, which made me more popular than being a “cult designer.” There was no such thing as cotton Lycra when I started in this business. In the early ’90s there were a lot of technical discoveries in fabric. I learned a lot about compression and how to make fabric to help you perform better. I have compression in almost everything. I love active, and I think it’s the most modern category you can design for because it can change how you feel about your body. You were at Coterie, which is great! Why did you choose not to show at Fashion Week this year? The idea of a fashion show got tired a long time ago. Fashion films have a more modern spirit and are more relevant than seeing clothing on the runway—not that I don’t think it’s beautiful—but I like seeing clothes in the context of a real situation. We have our photo shoot and do our film every season. The idea of doing film is very appealing to me, and I love the whole process. I feel like Woody Allen when I do them! Do you think that you will ever exit fashion to explore other categories? I think I’m morphing out of being a fashion designer and into being a designer. When I think of design I can’t imagine not designing active, or not doing swimwear, but I also have a lot of other projects that have to do with design, like fitness and health. All the things I’m doing right now are solutions for women in a global way—fitness, health, beauty, and style. I’m not necessarily stepping out of something…it’s like a snake shedding its skin and still being who it is but having this new gorgeous skin that’s no longer defined by the patterns it had before. It’s still what I do, but I just don’t want to be labeled “fashion.” We all have to go through that at different points in our lives, letting go of who you are. Clothing is just part of my DNA, so it will always be about clothing for me. I mean, can you imagine? I’ve been doing this since 1967. But think about all I can do at this point in my life. I have all of this knowledge and all of this ability to communicate now, and I can do it in a bigger way. Natalie Joos Is Leaving New York!